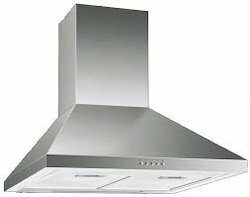 Manufacturer of a wide range of products which include exhaust hoods and chimney hoods. We are engaged in providing our clients with Exhaust Hoods that are available in different models along with various specifications. These exhaust systems are widely used in homes, corporate houses, industries, factories and commercial complexes for eliminating the hot & contaminated air from the inside. Our systems are manufactured using high-grade raw material, which is sourced from the reliable vendors of the market. In addition to this, we provide customization as per the specifications detailed by the customers. We are bringing forth a comprehensive range of Chimney Hoods in the industry. The offered Chimney Hoods are especially engineered and designed by our team of extremely qualified professionals. These Chimney Hoods are mad from break resistant material. Our Chimney Hoods are acknowledged for their simple installing. This ventilator is highly resistant scratch. Moreover, these Chimney Hoods can be custom made as per the need of the valued customers. Looking for Chimney Hoods ?